Jumpsuits are not for everyone. We can relate because we've worn a jumpsuit or two in our day and let's just say that it wasn't the most comfortable evening. Things were bunching in places that definitely can't be discussed here. The fabric was clingy and we won't even begin to go into how tedious the bathroom trips got by the time the night was over. We've even discussed this fashion faux pas among a specific group of people who are prone to wearing body-hugging jumpsuit: superheroes. We talked to lots of superheroes any many chose to remain anonymous because they didn't want to project an ungrateful image, however, many admitted that wearing a jumpsuit is their least favorite aspect of the job. Both female and male superheroes have voiced this complaint to us, so of course, we felt compelled to help solve this problem. We can't help it; we just love problem-solving, especially if the problem has to do with, you guessed it...costumes! 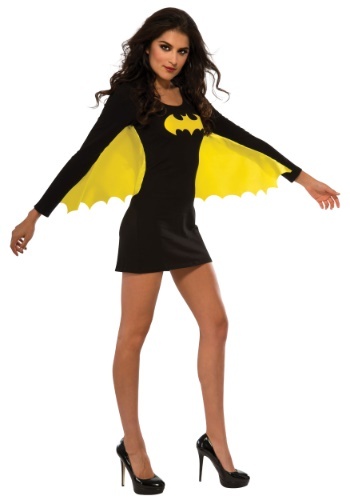 This women's Batgirl wing dress is a great alternative for those who want to become a superhero without contorting themselves into a binding jumpsuit. The spandex/cotton blend dress features long sleeves, a short (but sleek) hemline, a printed bat emblem, and yellow wings attached to the back like a cape. It's a feminine version of a typical Batgirl jumpsuit and we have to say- it's the most stylish superhero ensemble we've seen yet (and we see A LOT of costumes! ).